The changing landscape of fossil fuels presents increasing business risks for Australian domestic industrial and commercial energy consumers. Rising costs and uncertain supply of natural gas and existing high price of Liquid Petroleum Gas (LPG) represent a significant portion of this risk. Natural gas and LPG are used for greenhouse environment management and as a result, greenhouse operators are left exposed to an uncertain future for their fuels of choice. 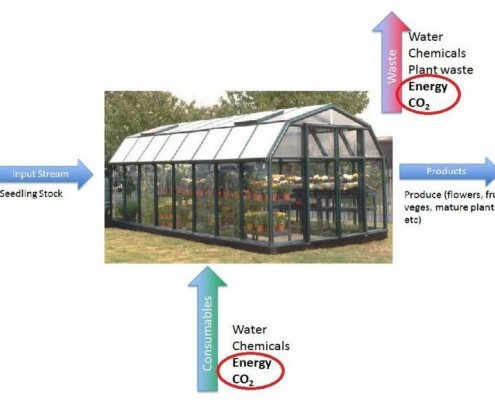 The primary source of heating in commercial greenhouses is typically inexpensive, simple and reliable, such as the combustion of coal or biomass. Natural gas and LPG are used for carbon dioxide (CO2) enrichment. This practice increases the rate of photosynthesis ~ increasing yield and reducing water consumption. There is widespread belief in the energy industry that carbon dioxide is a waste product that will incur a financial burden when a policy to price carbon is implemented. However, for horticulturists that apply CO2 enrichment practices in commercial greenhouses, carbon dioxide is a high-value commodity that can cost in excess of $400 per tonne. The conflict between these beliefs is complicated by the isolation of these industry groups from each other and the involvement of third parties for capture and supply of CO2. The current and developing policy landscape offers little or no remedy for these issues. Reconciling these conflicting beliefs offers the potential to address issues such as employment, carbon emissions management, climate change adaptation, and domestic food security through an industrial symbiosis approach. However, barriers exist in the form of infrastructure lock-in, cultural inertia, and the lack of enabling policy frameworks. The objective of the ‘Green Glasshouses’ (Sustainable Environment Management for Commercial Greenhouses) initiative was to inform horticulturists currently reliant upon LPG for glasshouse heating about options for renewable and sustainable energy resources. The renewable sources considered include solar PV, Concentrated Solar Thermal, wind, geothermal, bio-digestion and biomass. Integration of product and waste streams from other processes, particularly as applied to carbon dioxide enrichment inside the facility, were also considered. The Green Glasshouses project identified options for sustainable alternatives to natural gas and LPG combustion in commercial greenhouses. A range of case study greenhouses were chosen in order to compare and contrast the experiences and practices of each. This work was led by Ian Gesch, with The University of Queensland and the International Energy Centre providing administration and supervision. Starfish provided support through access to key networks, public communications and other guidance. This project was concluded October 2015. This research found that many sustainable heating and CO2 enrichment options exist for greenhouse operations when compared to the consumption of fossil fuels. Most of these, however, have low or no appeal due to relative cost (such as heat pumps and wind power), complexity (generating syngas from industrial or agricultural processes) or physical footprint (such as solar energy collection). Industrial symbioses also have low applicability due to the continued placement of greenhouses in regional areas as opposed to locating them adjacent to sources of waste heat and carbon dioxide. However, there is scope for the development of a properly functioning carbon market in concert with the tailoring of greenhouse design and operational practices to the Australian landscape. This has the potential to create opportunities for strengthening the business viability of commercial greenhouses, adapting to climate change and augmenting food security and export. Development of tools and methods that simplify the calculation of the true cost of CO2 enrichment and investigation into the potential for industrial symbioses between commercial greenhouses and producers of waste heat and CO2. An electronic copy of the abridged report is available by contacting Ian Gesch (see Starfish Associates).